From reading emails to checking social media to making online purchases, people are using their phones more than ever to engage and interact online, including by donating to nonprofits. That’s why text-to-give has (or should!) become a critical component in every nonprofit’s fundraising plan. Text-to-donate is not only convenient for the donor—the process generally only takes a few steps—but it’s also become a much more painless process for organizations. Donations aren’t capped at a certain amount, and nonprofits only have to wait a couple of days to receive funds. We’ll walk you through each of these text-to-donate services! Before we get started, you might be wondering “how does text-to-give work?” Snowball’s text-to-give guide provides a comprehensive look at this mobile fundraising method so you can brush up on the basics. Let’s start with our top two most recommended platforms: Snowball and OneCause. Snowball offers a unique text-to-give experience that allows donors to give in just two easy steps. Here’s how it works: the donor will text your organization the amount he wishes to give. He will be sent a link that redirects him to a pre-written confirmation email with the donation amount. Once the donor presses send, the giving process is complete! What makes Snowball’s text-to-give process so simple is that donors don’t have to fill in their payment information (except for the first donation) and there is no password required to confirm their contributions. 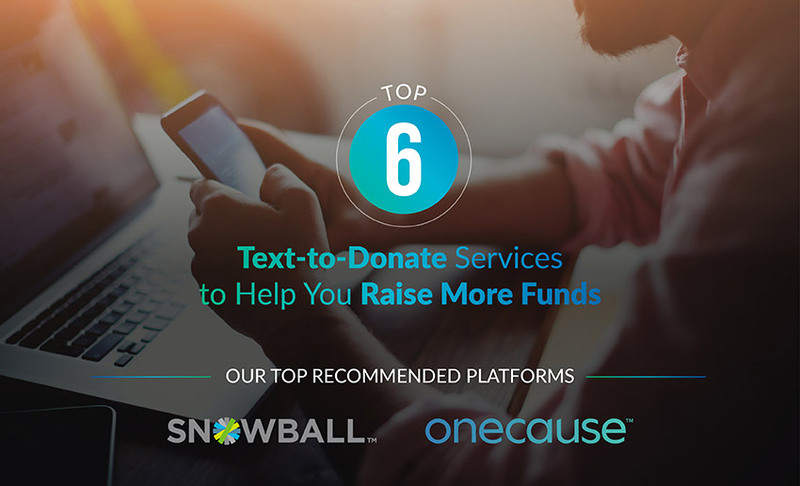 Best of all, since organizations don’t need any special equipment to implement these features, getting started with Snowball’s text-to-donate services is quick and simple. Nonprofits and faith-based organizations of all shapes and sizes are welcome to use Snowball’s text-to-give services. The platform also comes with other mobile fundraising tools like email donation buttons and custom mobile donation forms. It’s free to use Snowball’s basic fundraising plan! You’ll pay only a standard 2.9% + $.30 fee per transaction. More advanced, comprehensive packages including text-to-give tools start at $499/year. Contact Snowball for more information! Learn more about Snowball's text-to-give platform. OneCause created their text-to-give tool to help organizations maximize their fundraising potential during events. Whether your organization is hosting a gala, giving day, or concert, you can use OneCause’s text-to-give platform to encourage guests to contribute. To get started with OneCause, organizations will need to create a keyword. 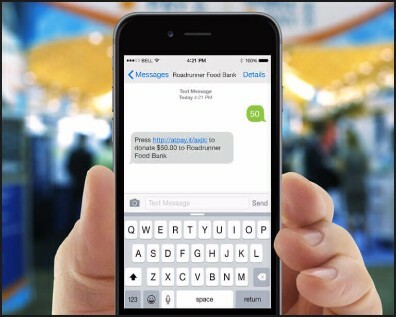 When donors wish to contribute, all they have to do is text that word to your nonprofit’s text-to-give number. Donors will be sent a link that directs them to a mobile donation form where they can complete their donation. Text-to-give donations can be integrated with OneCause’s other fundraising tools like their easy event scoreboards which will update donations in real-time. Since OneCause’s text-to-give tools can be integrated with their other fundraising software, your organization will be able to host an event that utilizes multiple fundraising avenues to reach your goals. Additionally, they have expert professional help to guide you through the set-up process. OneCause’s services vary in price depending on your organization’s specific needs. Request a custom quote on OneCause’s website to learn more. Learn more about OneCause's text giving tools. Did you know that many of your text-to-give donors could be doubling their contributions? With matching gifts software like Double the Donation, your team can provide mobile donors with all the tools they need to get started securing their matching gift from their employer. If you’re unfamiliar with matching gifts, let’s review this helpful fundraising practice. Many companies, from large corporations to small businesses, offer matching gifts programs to their employees. In these agreements, employers commit to matching donations to your cause at a 1:1, 1:2, or even 1:3 ratio. This means that if your nonprofit isn’t connecting supporters with the right matching gifts resources, you may be leaving millions on the table every year. Matching gifts software like Double the Donation empowers your nonprofit to share a matching gifts database with your mobile givers. Include it on your giving form, embed it on your website, or link out to it in your email streams. 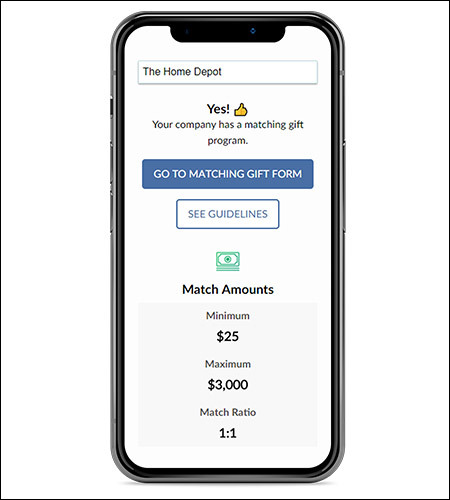 When supporters access your matching gifts database, they’ll see a mobile-responsive page like the one below that summarizes their matching gifts eligibility and how they can process their matching gift request with their employer. We love Double the Donation because their mobile fundraising platform makes requesting a matching gift as convenient as possible for your mobile givers. So many of your supporters primarily engage with your cause on their smartphones, so why not choose a matching gifts database that takes their experience as mobile users seriously? Learn more about Double the Donation's text-to-donate tools. 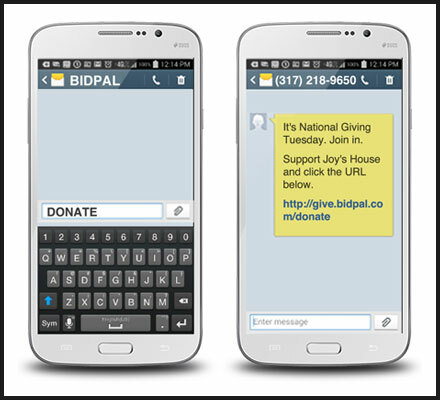 Pledgeling is a mobile fundraising tool, that allows you to communicate with supporters via text message. Donors also have the option of contributing to your nonprofit by texting a keyword to your shortcode. 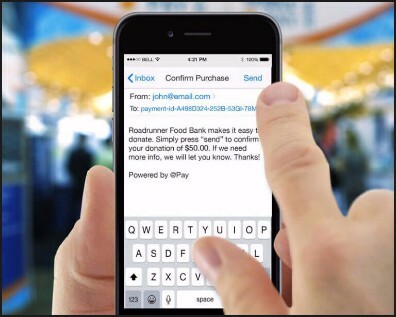 The platform will send the donor a link to your website or mobile donation form via text. Additionally, Pledgeling’s tool allows organizations to fully engage with their donors via text message. For instance, you can even accept inbound messages. That way, you can ask donors questions or have them compete in a contest. Organizations will also have access to analytics and reporting tools to help them assess their progress and make changes along the way. Pledgeling has an intuitive design that’s perfect for smaller organizations that might not have a ton of experience with text to give campaigns. Plus, setting up a text-to-give campaign can be completed in just a short amount of time. Pricing varies depending on the specific features your organization needs. Contact Pledgeling to learn more about their pricing packages. Learn more about Pledgeling's text-to-donate platform. 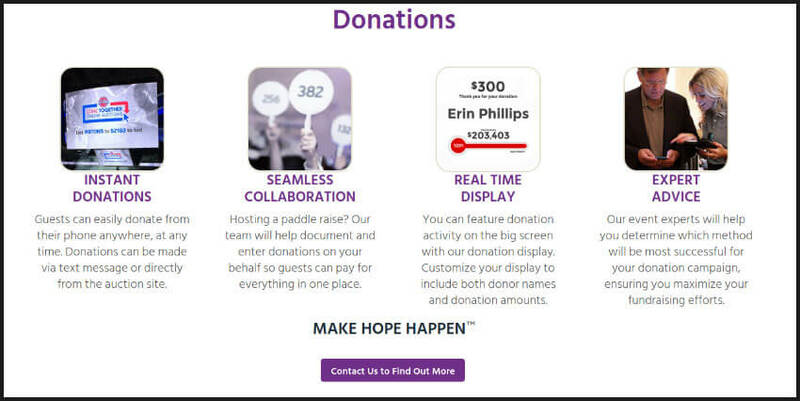 Gesture is a nonprofit tool that offers event fundraising solutions such as mobile bidding and text-to-give. The main focus at Gesture is to help organizations raise money during charity auctions. As a result, their text-to-donate tools can be integrated with their auction software, making it easy for donors to contribute, bid, and check into your event. Plus, you’ll be able to track your activity in real-time so that everyone at your event will know just how far you have left to reach your goals. Gesture has a team of experts that can help you incorporate text giving into all of your nonprofit’s fundraising events. Moreover, Gesture has a full suite of products that work seamlessly with their text-to-give tool. Gesture works with your organization to create a pricing plan that meets your needs and budget. For more information on pricing, request a quote on their website. Find out more about Gesture's text-to-give platform. Accelevents’ mobile fundraising software aims to make silent auctions and raffles a breeze for organizations. Instead of using an app like many mobile bidding tools, donors can bid on auction items via text message. This makes the process more familiar for donors and allows supporters to participate in your charity auction even if they can’t attend the event. Bidders will receive notifications when they’ve been outbid, generating excitement and encouraging donors to continue bidding. In addition to charity auctions, Accelevents also has tools that allow donors to participate in raffles. They can simply purchase and submit tickets through text messages. Since Accelevents’ tools don’t require donors to have any additional applications, the donation process is quicker and easier for donors to understand. If nonprofits want to get started with Accelevents, they’ll have to pay a $99 start-up fee and a $1 per donor that participates. Learn more about the text-to-give options available at Accelevents. As you can see, there are plenty of text-to-give platforms that provide top-notch services to organizations. Hopefully, this list has helped you find the right tool for your next fundraising campaign! Top Fundraising Software Platforms for Nonprofits: If you’re looking for more fundraising solutions, use this list of platforms to help narrow down your search. 21+ Annual Fund Strategies: Incorporating a text-to-give campaign in your annual fund is a great way to boost donations. Discover even more tips to increase your fundraising potential. More Text-to-Give Services: Couldn’t find what you were looking for? Why not check out this list of even more text-to-give platforms from Double the Donation?